The last six months have seen a great deal of hard work, adaptation, changes and planning. They have also been the first six months of the Fédération Cynologique Internationale’s new plan for the future and during this time we have reached a consensus on working together to build a platform for the new FCI. 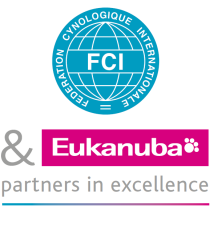 Ever since the very first day on which I became chairman, I have been determined that the FCI would begin this new era strengthened and united, in order to face up to the challenges that lay ahead of us all, and to make the changes needed in order to convert the FCI into a proactive organisation which would benefit not only our members but - far more importantly - the dogs of the world. Creation of the Bulldog Club which we call “English” but which, in reality is British in England (British Bulldog). It was the first breed club in the world. June 5 & 6th: First show in Holland devoted only to dogs (no poultry), was organized by “Nimrod” at the Utrecht “Tivoli” Park with 350 dogs. The Newfoundland, with 23 exhibits, was the most represented. First standard: the Bulldog which served as a model for all the British breeds. It was presented as “a model of care and exactness”. Nevertheless, it was later accused of being the cause of health problems due to phrases such as: “The muzzle (…) must be as short as possible” or “the larger the skull, the better”: these phrases were removed in 1986. One characteristic of this standard: it contains no scientific terminology. The incisors are called “the six little front teeth”. We note that the standards of the time, English or continental, did not carry the names of the authors; this is a prejudice for the history of the breeds and it persists today, except in France where we know who wrote what. Publication of the first German cynological magazine, der Hund (the Dog), on April 1st. Foundation in Berlin of the “Hektor” Cynological Society. “Nemrod”, the Dutch club, published two pamphlets in June: one about the standards for hunting breeds, the second for other breeds. The English standards were translated into Dutch. The others were written by “Nimrod”. First edition of British Rural Sports by STONEHENGE (his real name was John Henry WALSH). Many were to follow. It is a huge tome of more than 900 pages covered in very small print, explaining in detail of what these very English “open air sports” consisted of, ranging from hunting to horse racing, cricket, football and tennis and giving the descriptions and standards for 29 dog breeds along with the rules for showing. The Society for the Improvement of Dog Breeds (“Veredelung”), which was founded in Hanover in 1839 as a hunting society, kept a Stud-book along the lines of the English model. The Delegates Commission (“Delegierten Commission D.C.”) was created and established a centralized register, the “Deutcher Hundestammbuch” (DHStB). Thereafter many clubs were founded, each keeping its own Stud-book. The best Pincher exhibited at the Hanover show was called “Schnauzer” (according to The Complete Dog Book). This proper noun became a common noun to designate dogs which, until then, were called “Wire-haired Pinscher” or “Stable Griffon”. The second Belgian show was held in Brussels with around 1000 dogs. The “Cercle de Chasse” (Hunting Circle) was founded in Paris and acclaimed in the weekly magazine La Chasse illustrée (May 29, 1880). The “war against poachers” was still an issue. It was a very private club where requests for membership had to be “supported by two proposers” except for princes and ambassadors who were accepted “on simple request”. The President, the Marquis de NICOLAY, was “very well known for his activities in the “Société Centrale des Chasseurs” (Central Hunting Society)”. The committee was practically made up of aristocrats only, of whom many were huntsmen. On June 8, 1880, the “Cercle de la chasse” founded the « Société d’encouragement pour l’amélioration des races de chiens en France » (Society in support of the improvement of dog breeds in France), thus imitating « The Jockey Club » which had founded the “Society in support of the improvement of horse breeds” (La Chasse illustrée). The aim of this Society was to “establish a register of origins”, “to organize, in Paris, periodical exhibitions”, etc. Publication of the rules of the Society which became the “Société Centrale pour l’amélioration des races de chiens en France” (Central Society for the improvement of dog breeds in France). According to to J.A. MILLER this name remained unchanged “during forty four years”. The name “Société Centrale Canine” (Central Canine Society) dates from 1925. Publication of “the most important cynological work of the XIXth century in English” (according to HUBBARD): The Illustrated Book of the Dog, by Vero SHAW, fancier of Bulldogs among others. His work, translated into German, was crowned with success in Berlin and Vienna (HUBBARD). The author, a graduate of Cambridge, first recalls the works of Dame Juliana BERNERS, Dr. John CAIUS, LINNÉ and CUVIER. He was undoubtedly one of the first to establish a list of “technical terminology” including jargon, and subtleties, in regard to the coat such as “thumb mark”, “kissing spots” or “pencilled toes”. He stressed the importance of dog shows and field trials which had an important impact on the quality of British dogs. Shaw studied 61 breeds or groups of breeds such as “the Asian dogs” or the “French breeds”. Even though they are sometimes a little fanciful, the presentation of the breeds and their origins reveal his great knowledge and literary culture. Then came the standards called “the properties”. For example, that of the Bulldog (written “Bull-dog”) is divided into 80 “points” followed by a “Scale of points”. It is in this extraordinary, large format, 664-page work, superbly illustrated for each breed, where we find the expression “the foreign dogs, those that we secretly despise”. But, it was to warn the British that they were wrong to despise them – that this attitude was only the result of their ignorance. Moreover SHAW had good knowledge about the importation of English dogs into France and Germany and about the cross-breeding carried out, for example, in hounds or English Pointers with Continental Pointing dogs. “La Société Centrale” organized its first show in Paris, at the Tuilerie Gardens on June 4 & 5, 1881. Among the committee members were GEOFFROY SAINT-HILAIRE, Director of the Jardin d’Acclimatation, Count LE COUTEULX DE CANTELEU, famous for his Manuel de Vénerie française of 1890, Amédée PICHOT, Baron Arthur de ROTHSCHILD, Count ZAMOYSKI and an Englishman, Sir Colville BARCLAY. Concerning the show, we shall quote MILLER: “As the standards for French breeds did not yet exist, the organizers proposed categories based on the colour of the coat, mixing all the breeds”. This gave rise to numerous protestations. In England, The Kennel Club took over the Kennel Gazette which had been launched the previous year. It is still published today on a monthly basis. Creation of the Scottish Kennel Club. The first Italian dog show was held in Milan, on September 19th with around forty dogs of ten or so breeds. From September 3 – 10: the first Swiss dog show was held in Zurich with 200 entries. The first dog show was held in Saint-Petersburg, capital of the Russian Tsars. The rules and regulations of the “Société Centrale” were submitted to the Chief of Police of the Seine for approval. It was independent from the “Cercle de la chasse”. Its headquarters were at 1 rue Royale, Paris. It was state-approved in 1914. Creation of the “Société Royale St. Hubert” on February 18th. 50 “gentlemen”, among whom Count Carlo BORROMEO and Prince Emilio BELGIOIOSO D’ESTE, founded a society for the improvement of dog breeds in Italy. The presentday name “Ente Nazionale della Cinofilia Italiana” only dates from 1933. For a long time the Italian organization adopted a classification of breeds in three categories; hunting dogs, utility dogs and companion dogs. The Italian stud-book (L.O.I.) was created shortly after the Italian Kennel Club was formed and the first inscription was Falco, a “Bloodhound” born in 1875. Publication of the first Société Royale St. Hubert (L.O.S.H.) stud-book. On November 11th , 1883, the Belgian magazine Chasse et pêche, sport, vie en plein air which was created in Brussels in 1882, became Chasse et pêche, acclimatation, elevage and the official publication of the Société Royale St. Hubert. Foundation of the Swiss Canine Society on June 9th at the “Hôtel National” in Zurich. 26 cynologists held a meeting at the third dog show held in Zurich from June 8 – 12 in accordance with a decision taken the previous year at the Aarburg show (May 14 – 18). The rules were approved and the committee was constituted on July 14th., 1883. The first president was Jacques CRAMER, from Zurich, and the second, from 1884 to 1886 was Benjamin SIEGHUND from Bâle. At the onset the Society was created for the whole of Switzerland but it was Zurich and St. Gall, in the Winterthur region, which remained the most important centre (till Hans MÜLLER, from Seuzach, elected in 1982). This show in Zurich attracted 350 dogs, among which 65 St. Bernards and 65 Swiss Scenthounds (Laufhunde). The first committee was comprised almost exclusively of “upper class” gentlemen: doctors, veterinary surgeons, business men and politicians. Many stayed on the committee for a long time. It was Max SIBER, secretary of the first Assembly on June 9th., who was considered as the “true father of the Swiss Canine Society”. February: publication of the first Swiss Stud Book, written by SIBER. March 15th : foundation of the Swiss Saint-Barnard Club. June 23rd : General Assembly of the French Société Centrale and approval of its new rules and regulations. Publication of the first French stud-book (L.O.F.). The first dog registered on March 11th. was a French Griffon, Marco, born in 1879, bred by Emmanuel BOULET, first prize at the 1882 Paris dog show. The second was his son, born in 1882. His dam was his sire’s sister. The breed, now extinct, was called “Griffon Boulet”. Until May 1934 all breeds were registered together. This first stud-book (L.O.F.) contains 1000 registrations from March 11th, 1885 until March 29th, 1889. We observe, as of 1885, the registration of an “anglo-poitevin” cross-breed, an “anglo-saintongeois” cross-breed as well as an “anglo-poitevin saintongeois” cross-breed, which demonstrates the high numbers of English hounds imported to France and the absence of the derogatory connotation of the term “cross-breed” when it concerned the hunting community. The first Borzoi, registered under this breed name on June 30th, 1902 (before they were referred to as “Russian Greyhounds” or “Circassian hounds” ) was called Boris and the first German Shepherd, in 1906, was called Fritz. Note that this first stud-book of the “Central Society for the improvement of pure-bred dogs in France” had been created in 1883 by Mr. CREMIÈRE, editor of the magazine Le Chenil. Taken over by the Central Society, it comprised, in 1889, as the principal breed the Gordon Setter with 222 registrations, followed by English Setters and Pointers, Griffon Pointing dogs, Irish Setters, Great Danes, Braques St. Germain, Cocker Spaniels, Basset Vendéens and Beagles. The first Poodle registered (n° 142) was Mylord, born on January 20th, 1884. From the beginning of the L.O.F. the following French breeds were registered (along with the ten most represented breeds mentioned above): “Chien courant Saintongeois”, “Braque Dupuy”, Epagneul Français”, “Basset Français”, “Basset Griffon with straight forelegs”, Chien de Berger français” (with no other precision), “Griffon Courant de Vendée”, “Chien de Bouvier”, breed names which we will not always find the following years. The first female Borzoi called Marguerite, still in the year 1885, was classified as “Russian Greyhound (Orloff breed)” and the first Great Dane as a “Danish Dogue”. The first Pug was not registered until 1886, after the “Griffon Français with crooked forelegs”. First show organized by the Swiss canine Society in Basle on June 1st. with 197 entries of which 81 were St. Bernards. The famous French periodical, l’Eleveur, was founded by Jean Pierre MEGNIN (known as Pierre Megnin) (1825-1905), former army veterinary surgeon and Laureate of the Institute. As the title of its first issue implies, l’Eleveur aimed to be scientific: “Illustrated weekly magazine for applied zoology, hunting, acclimatization and comparative medicine for useful animals”. From the first issue, CUVIER and the creation of breeds and varieties are quoted. “Natural breeds” (wild state),“artificial or domestic” breeds “created by humans” are distinguished. It is easy to see the term “useful animals” in the title. Everything is covered from a human point of view. It was the trend at the time. The great zootechnicians of the time considered domestic animals as “animal machines” which must be “exploited” (SANSON 1826-1902), as “living machines whose production and functioning must be supervised by zootechnicians” (BARON – professor of Zootechny at the Alfort veterinary School – 1878-1908). They were far from the notion of cynology, nevertheless l’Eleveur was an important tool for learning about canine breeds. It was published up to 1960, under the direction of Paul MEGNIN, Pierre’s son. Charles CRUFT organized his first show, restricted to terriers which were very popular in Great Britain, at the “Royal Aquarium”, Westminster, with 570 entries. It was in 1891 that this show, held at the Royal Agricultural Hall until 1939, became the “Cruft’s Dog Show”. More than 2000 dogs took part in the 1891 show. Charles CRUFT, a salesman for James Spratt’s dog biscuits, was a genius at organizing and a born showman. He never owned a single dog. The Grand Duke Nicolas NICOLAIEVITCH ROMANOV, nephew of Tsar Alexander II, and a great hunter, became the proprietor of the Perchino estate, in the Toula province, where his Borzoi kennels were to become famous. Foundation of the Pointer Club in England (LEE). On January 12th, the Great Dane Club (Deutsche Doggen Club) was founded in Berlin. It claims the title of the “oldest German breed club”. In June, the German Dachshund Club (Deutscher Teckelklub) was founded in Berlin by Messrs. ILGNER and HAN. It was the oldest of the founding member clubs of the “Kartell” in 1906: predecessor of the V.D.H. The first lady was authorized to judge. She was Mrs. Mary Ann FOSTER, from Bradford, and she judged at Manchester. Beforehand she exhibited Yorkshire terriers (Oliver).